Today was such a miserable day outside, I decided to cheer myself up with some fun memories of a day out last year. 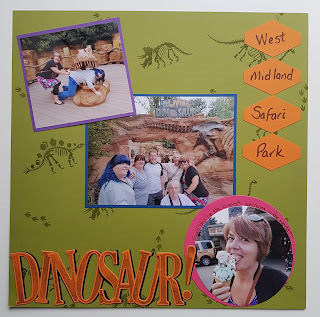 We were visiting family in the Midlands here in the UK and they took us to the West Midlands Safari Park. There's an area in the park for children both big and small full of dinosaurs. I NEED to take my grandsons to this place, they'll love it! 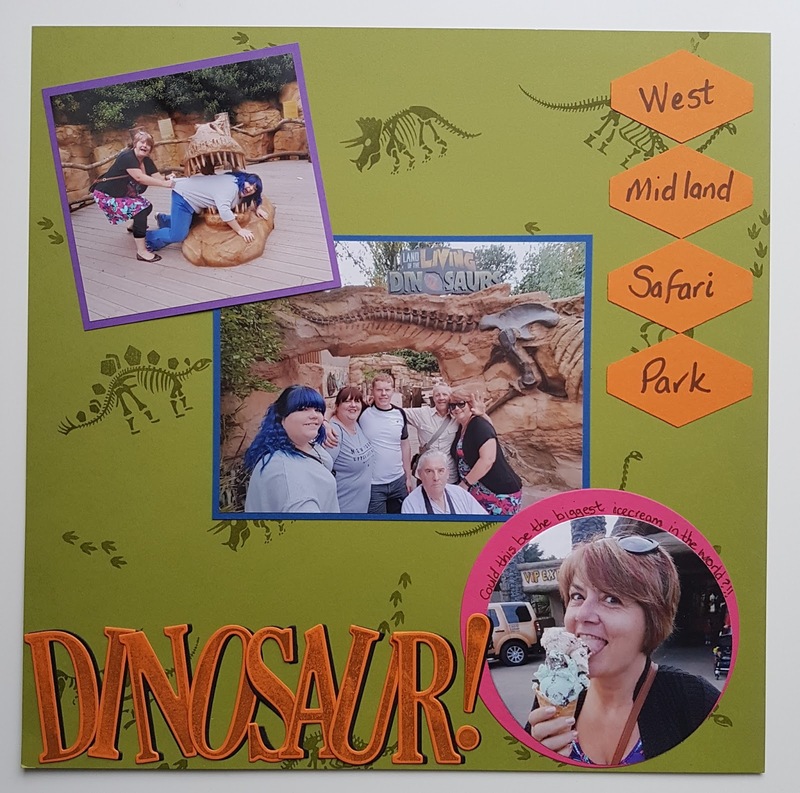 I chose three photos to create this 12 x 12 scrapbook page. Then decided on colour. 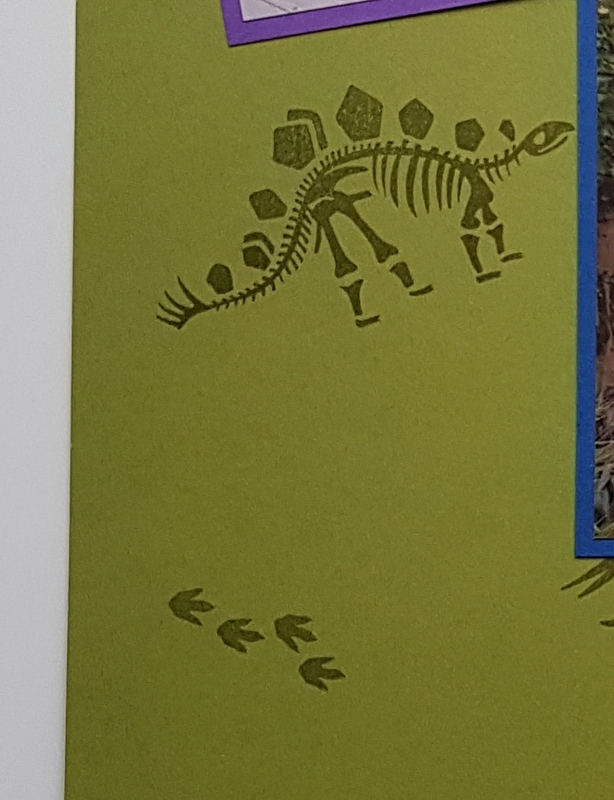 Dinosaurs were green, right? 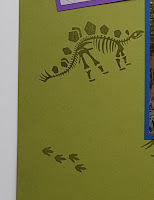 So Old Olive card stamped with dinosaur skeletons from the No Bones stamp set using Old Olive ink. 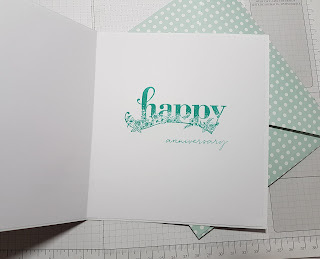 Next, the letters were stamped using Crumb Cake ink on Pumpkin Pie card, then cut using my Large Letter die set. I off set them to represent a shouted word. I also punched four shapes using my Tailored Tag Punch. Finally I matted the photos with Melon Mambo, Gorgeous Grape and Blueberry Bushel. The final result, a fun page showing some hijinks from the day. Hi, my name is Karen and I'm an Independent Stampin Up Demonstrator based in the UK. 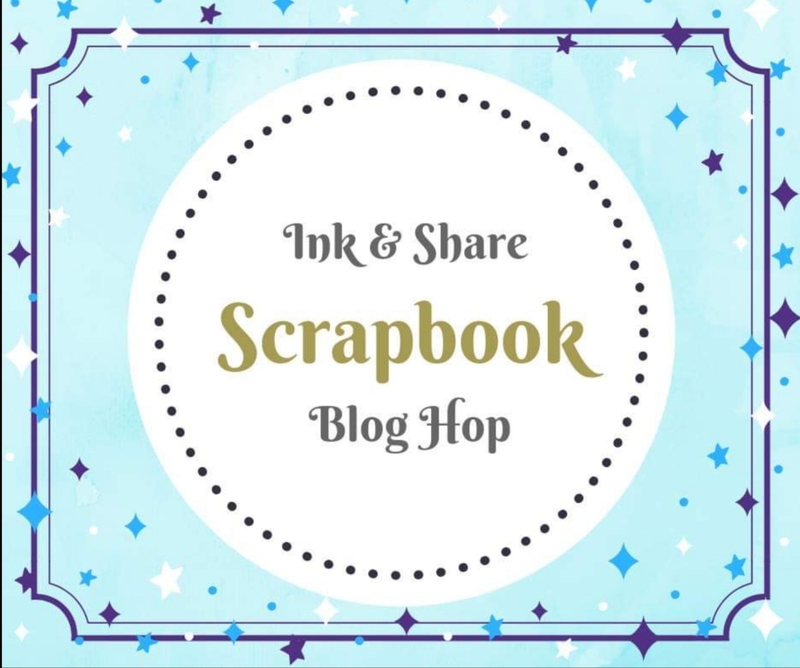 Whether you've hopped in from Cindy or found my blog purely by accident, I welcome you! 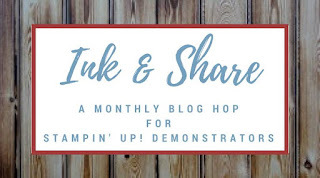 Hello Crafters and welcome to another Ink & Share Blog Hop! 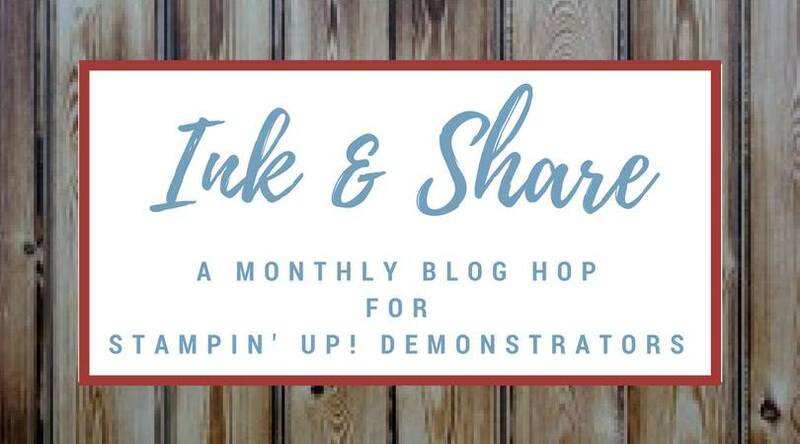 We are a group of IndependentDemonstrators from all around the world who have got together to create some fun little projects on the same theme. This month we are featuring some of our favourite things from the Occasions Catalogue. This is the seasonal one rather than the main catalogue. 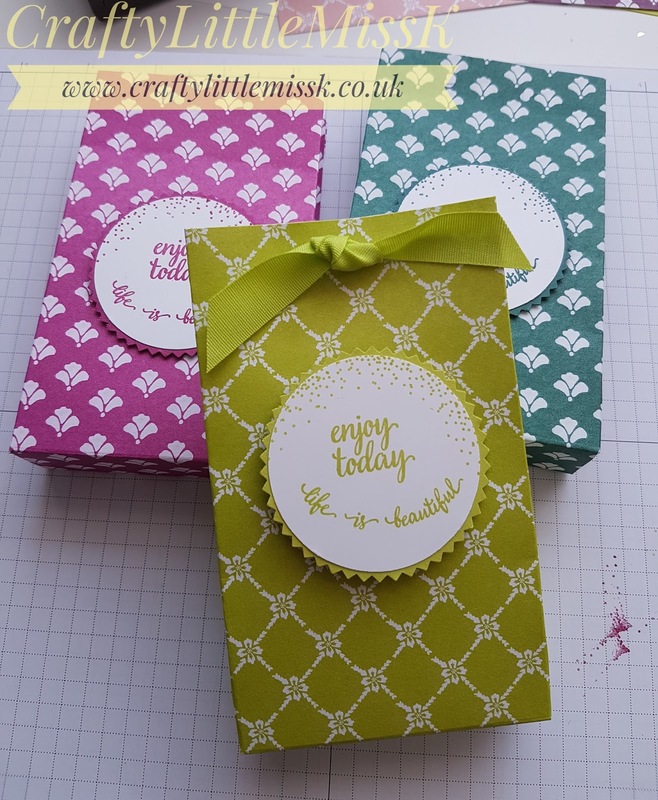 I chose the Magical Day stamps and matching die set, plus a piece of the Designer Series Paper. My daughter had contacted me to see if I could make up some little things to sell for an event near her. 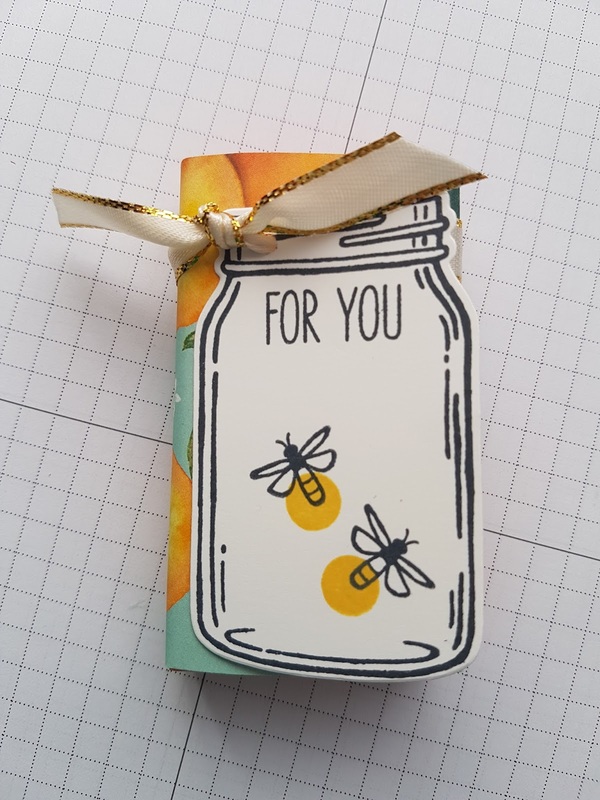 I cant make it but thought if she wanted to put a table up, I'm more than happy to give her some goodies. I was given something similar at Onstage this month as a swap, so wanted to recreate it. I had such fun making it too! 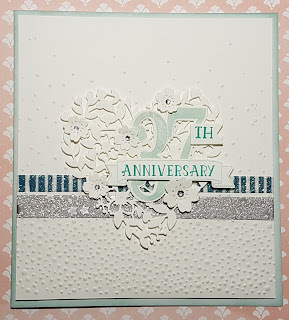 All I needed were some scraps of card and DSP, the stamp set and my Stampin Blends. I just love how the Soft Sky and Old Olive colours merge on the mermaids tail. 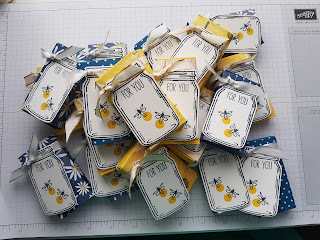 I used the Starburst Punch and the 2" Circle Punch first, then die cut using a Stitched Framelit circle. 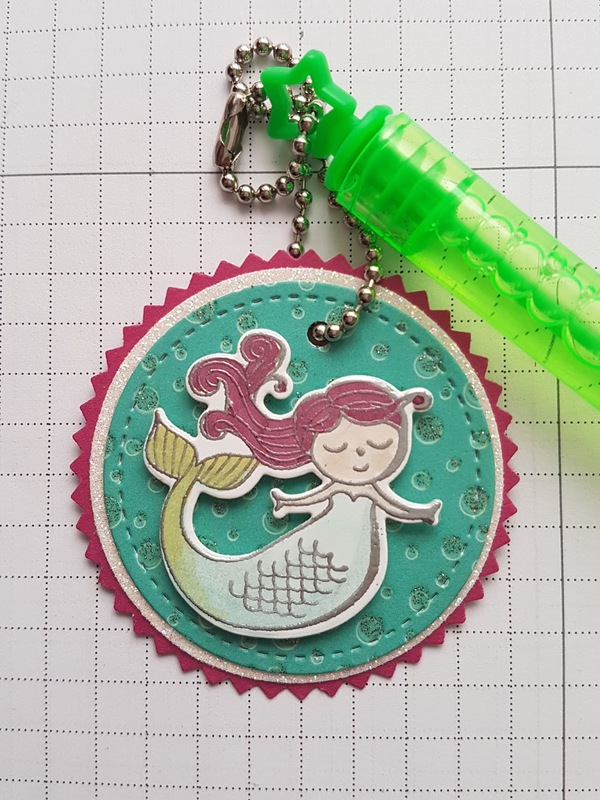 Mounted the mermaid on Dimensionals, added the key chain and mini bubble wand and hey presto - a cute little gift any little girl would love ... I'm sure my 3 yr old granddaughter will have this off mer mummy as soon as she sees it! Karen Pearmain - you are here! 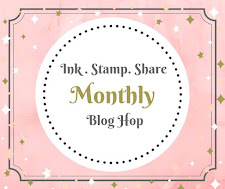 Welcome to the latest Stamp n Hop Blog Hop!! This month we are featuring our favourite items from the retiring catalogue. Its always sad to say goodbye to old friends, but its also exciting to be seeing new things too. I was lucky enough to attend Onstage Local in Telford (UK) so have already had a drool at all the lovely new crafty goodies Stampin Up! will be bringing to us as of 1st June. So, what were my favourites over the last 12 months? 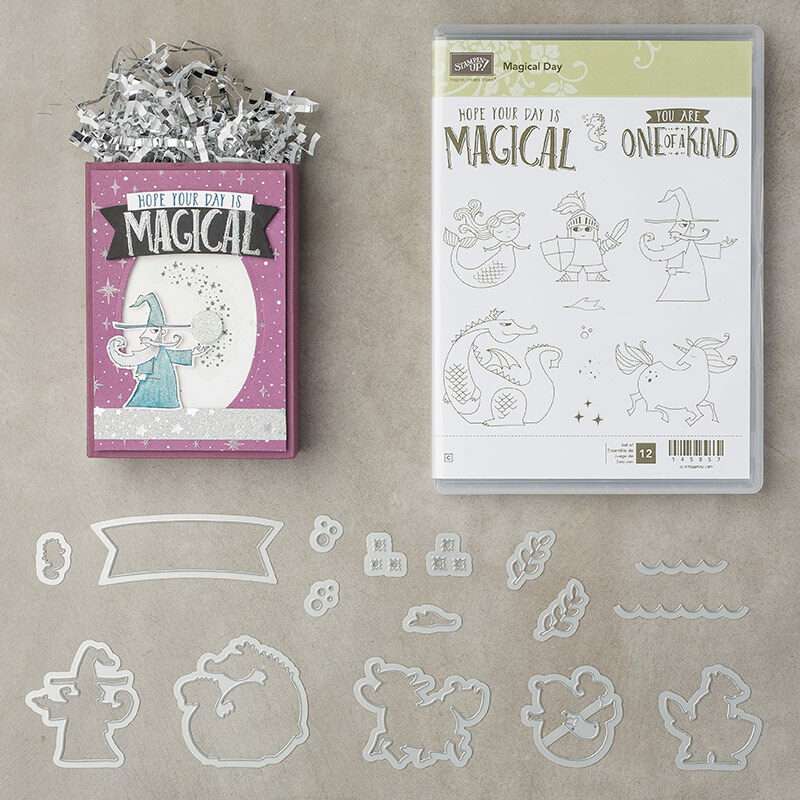 So many stamp sets and other crafty items. I think the biggest thing I will miss will be the Fast Fuse. That little roller helped me make many gift bags and boxes since I joined SU just over a year ago. There's nothing to replace it so I I guess I need to make friends with Tear n Tape now haha. 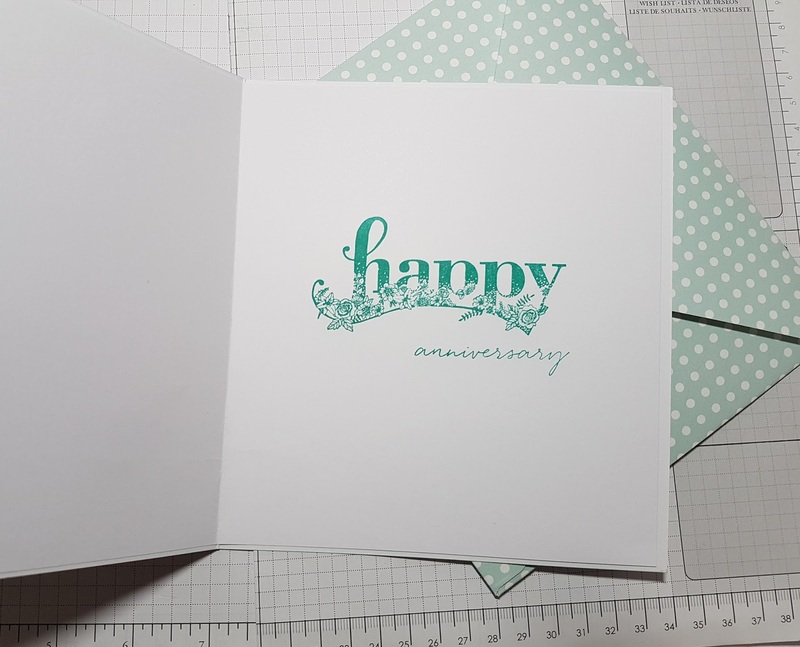 I sat for some time deciding what I would showcase from the many retiring items and eventually decided to make my husbands anniversary card as thats only a couple weeks away. that meant it had to be Bloomin' Hearts. 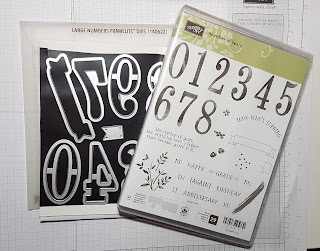 I never got around to buying the stamp set, but I have used the Thinlit dies many times. The colour theme was easy. 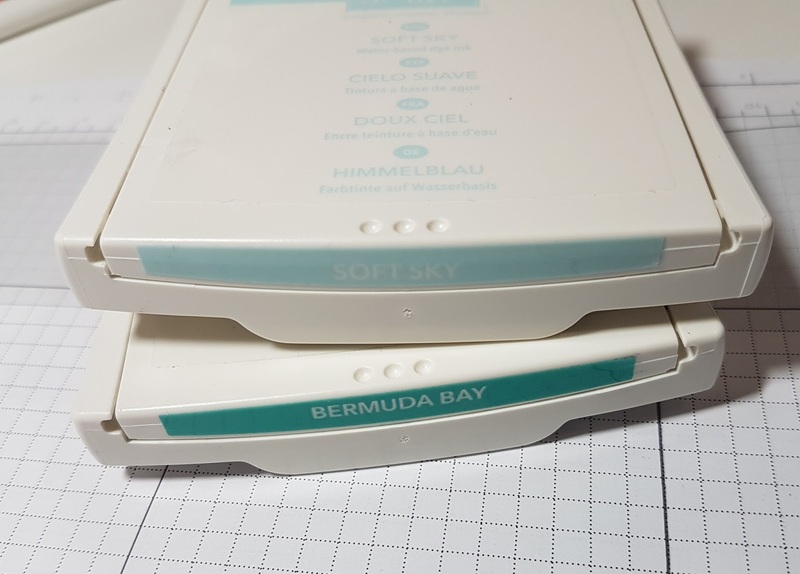 I almost shed tears over saying goodbye to Soft Sky. I teamed it with Bermuda Bay, they work so well together. 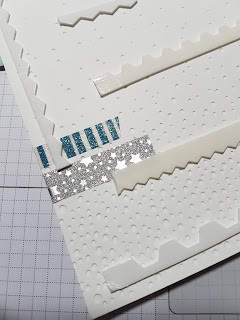 I wanted to make a larger card than usual, which meant using the Envelope Punch Board to make my envelope. I used an even older retired paper for that! 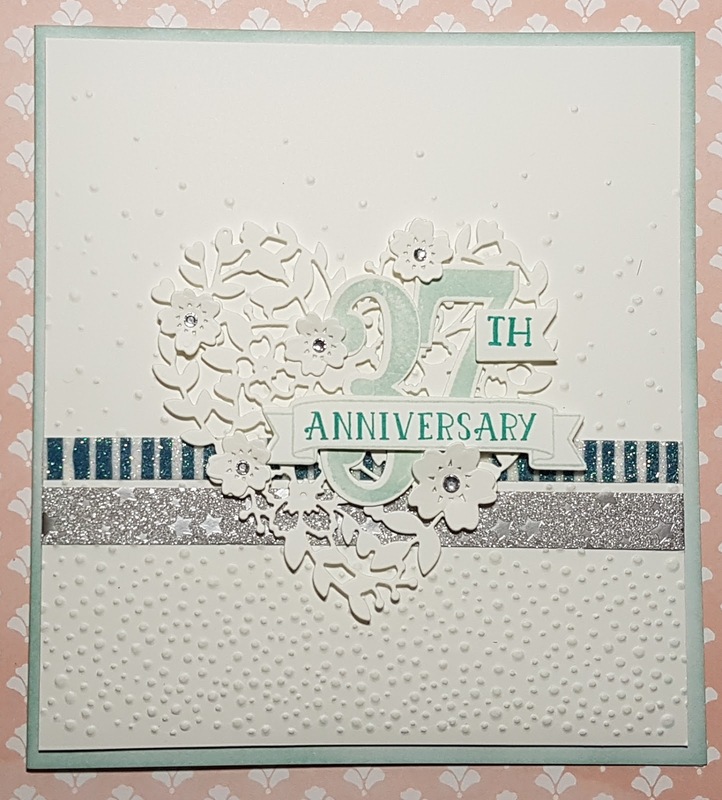 Putting the card together, I decided to use the Softly Falling Embossing Folder and layered onto white card sponged round the edges with Soft Sky ink. 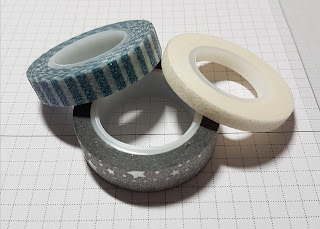 I wrapped the Washi tape round, then used the edge pieces from my Dimensionals to raise the layer up. I then added all the elements adding a bit more bling with some Rhinestones. Good morning bloggers! Today I'm off on a mini adventure. I'm attending Onstage Telford and I'm pretty excited. This will be my second Onstage so I know a bit more about how things run, but it's still a big mystery what's going to happen as they like to surprise us. 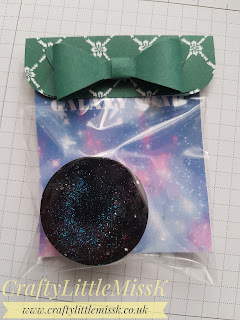 As soon as I saw these Galaxy Soaps on Pinterest a while back, I knew I wanted to make them for my next Onstage event! Then came the packaging. 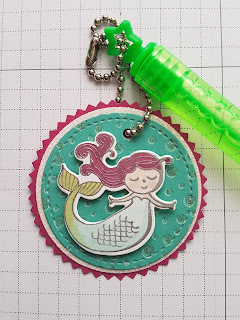 It has to be made using something current in the Stampin Up! catalogues. 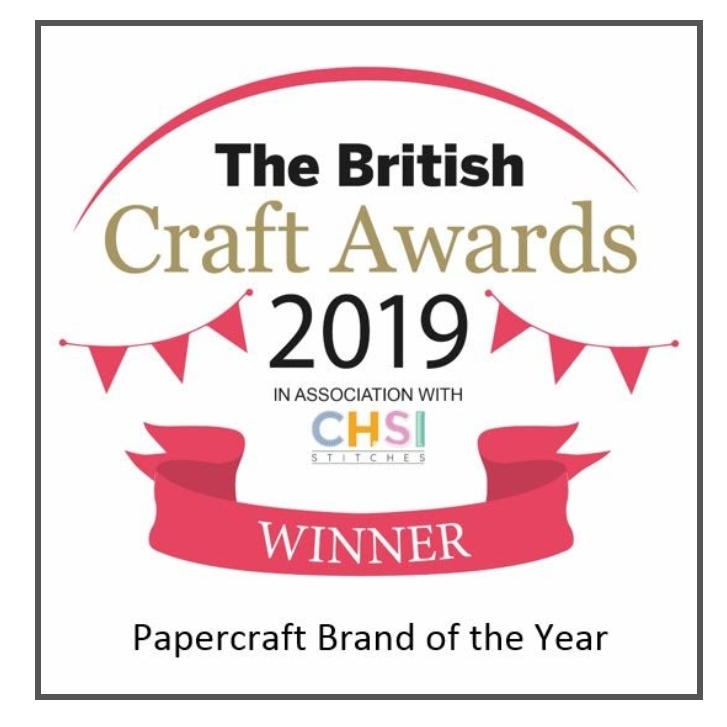 I eventually chose the Designer Series Paper for the In Colours 2017-19. These cute little bags were easy to make. 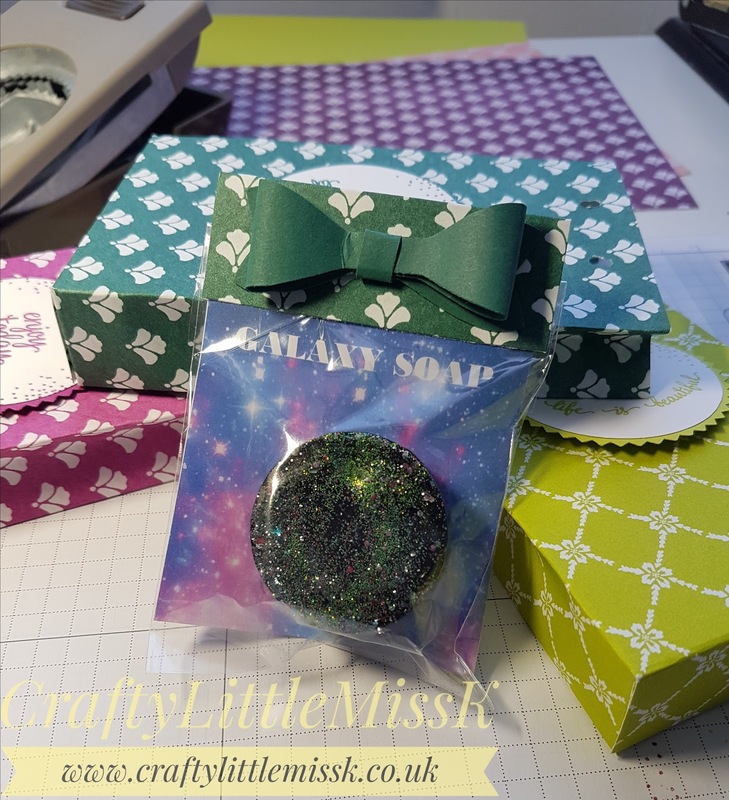 Making 30 as well as the inside packaging certainly made a dent in my DSP supplies! Thank you for stopping by today. Hope you have a glorious day! Today I'm sharing what I have been making for fellow team members to wear at Onstage at the weekend. Onstage, or Onstage Local, to give the proper name, is an event that happens twice a year - April and November. This year Stampin Up! 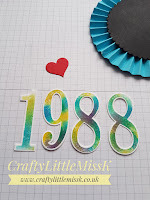 is celebrating 30 years as a company and so it's party season! We have been asked to join in the fun and wear 1980's style clothing. Well at my size and age, I'm not going to be wearing any lycra but I do have some bright pink leg warmers and some other items. 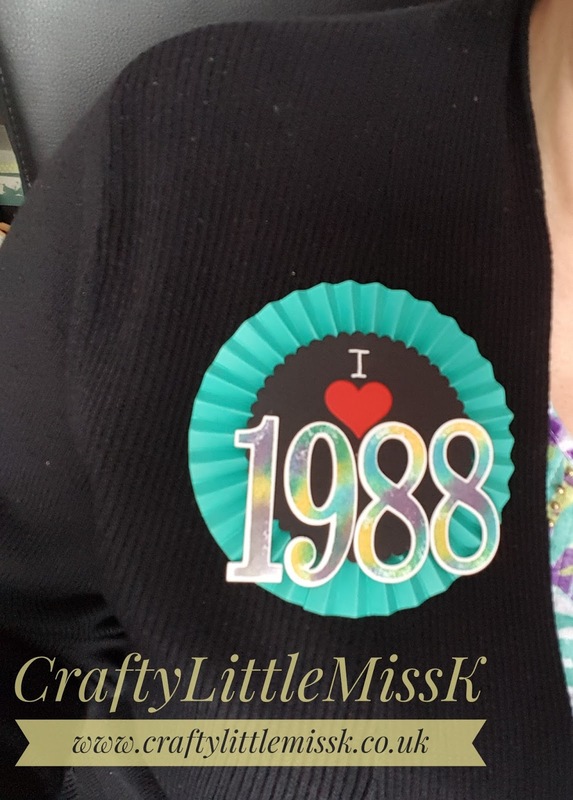 I decided to help us stand out as a team and made these large badges for us to wear! 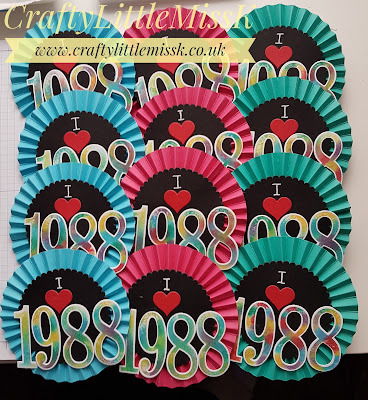 To create these I cut 2" strips from A4 sheets of card. I then scored every half inch along the length. Turned over then scored every 1/4" and 3/4" to create the concertina effect. You will need a length and a half for each rosette. Join the ends to create a ring. 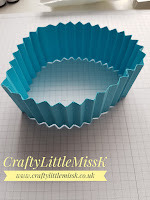 Heat up your glue gun and punch out a circle for your base. 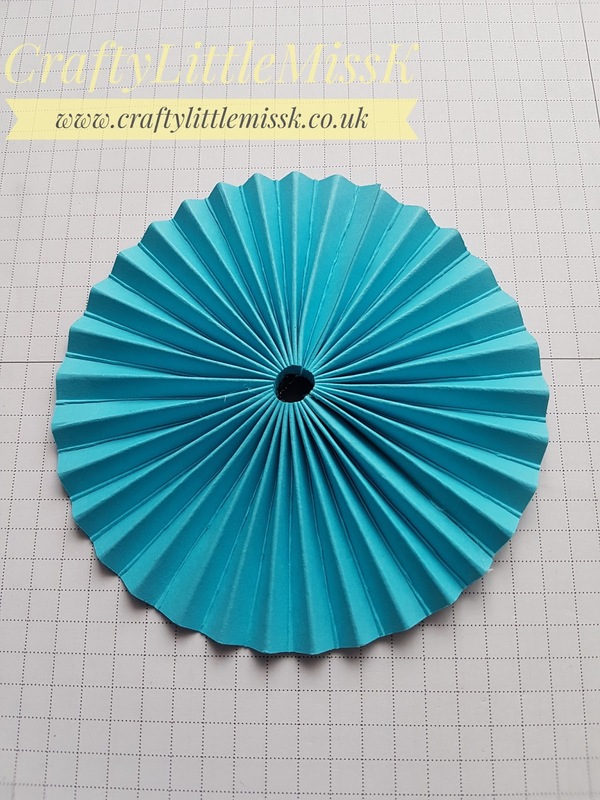 When glue is ready, gently press down on your concertina ring to create rosette, hot glue centre, gather tightly into the centre and hold in place until glue 'takes'. Be careful not to burn your hands! Place a larger circle on the front using the hot glue. 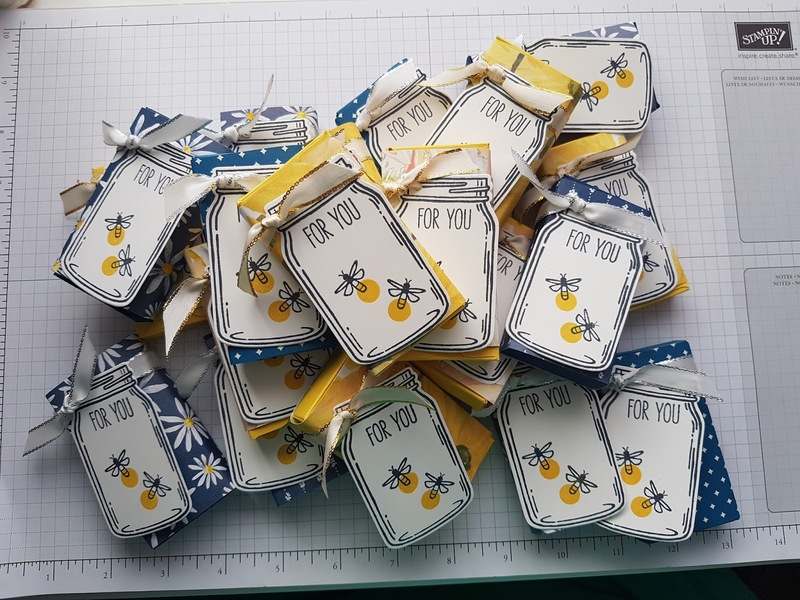 I used the Starburst punch from Stampin Up! I then stamped and die cut the numbers 1, 9, 8, 8 and also a small red heart. The numbers were coloured using the "baby wipe technique" - I'll do a demonstration soon on that. 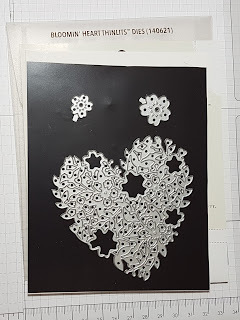 Finally, I stuck the numbers down first (using ordinary glue), then placed the heart centrally and then added the letter "I" using a white gel pen. 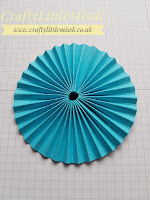 To finish it off, I hot glued brooch backs onto each rosette. Hi and welcome to my little blog. If this is your first-time, I hope you take the time to look at my other projects. I normally try and add something new once a week, although just recently outside influences have stopped me. However, it's a bright blue sky out there, and it seems spring may just be finally here. Plus I have an unexpected day off! Today's project involves chocolate! Isn't that the best kind? 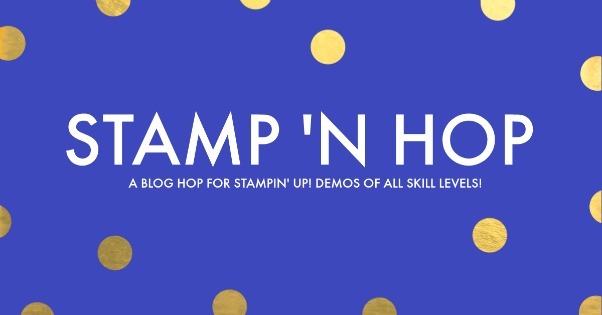 I'm going away for a couple of nights to a big crafting convention hosted by Stampin Up! Called Onstage Local, and am very much looking forward to mingling with 400+ other Demonstrators, many of whom will be swapping cards and 3D items. My little treat boxes are for the Saturday night when a group of about 20 of us will be having a meal together. 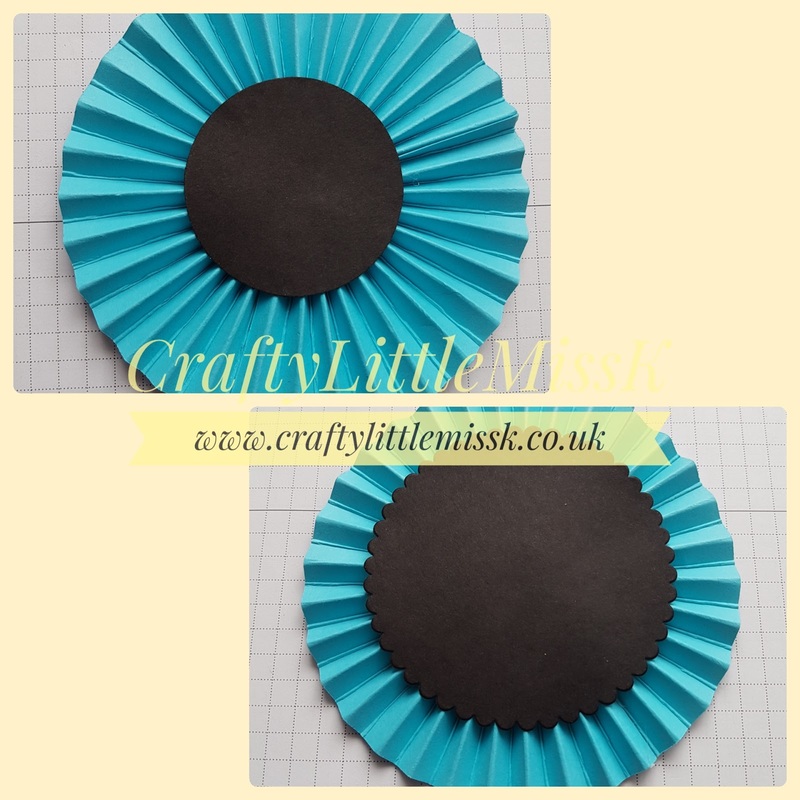 To make these you will need a piece of card measuring 4 7/8" x 4 7/8". 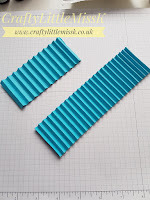 You will also need two pieces of DSP (designer series paper). 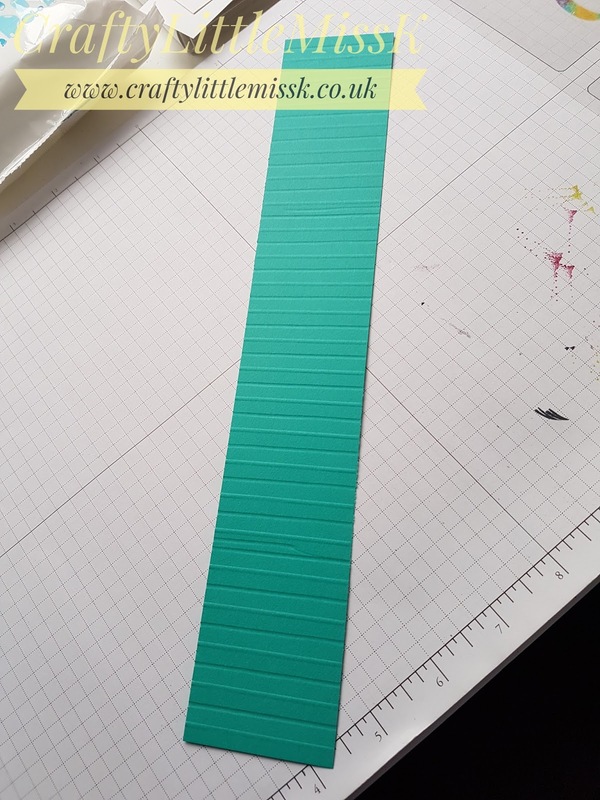 One measuring 5" x 3 7/8", the other 3 7/8" x 1 1/2". 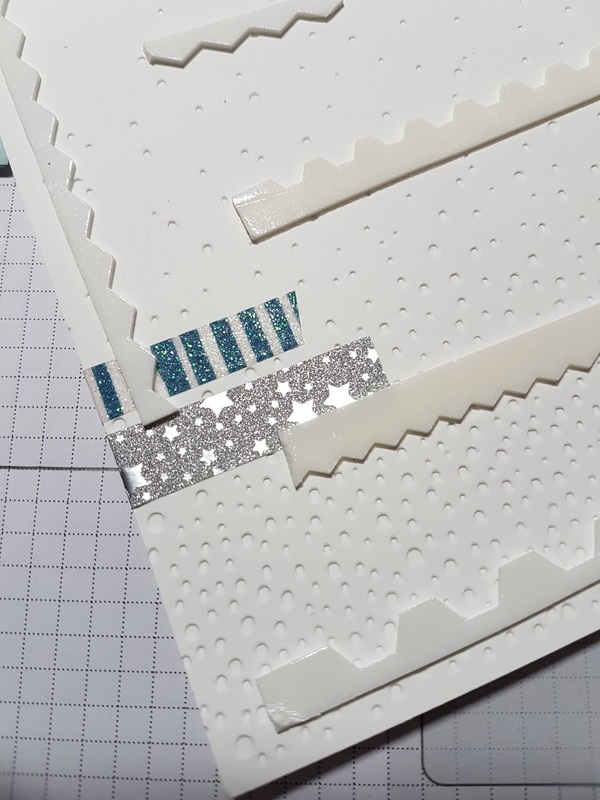 Envelope Punch Board (EPB), bone folder, scissors, glue. Oh and a chocolate Freddo! With your EPB punch and score at 1 1/2" and at 2 1/4". Then follow the score lines, punching & scoring on all 4 sides (see YouTube demonstration below). 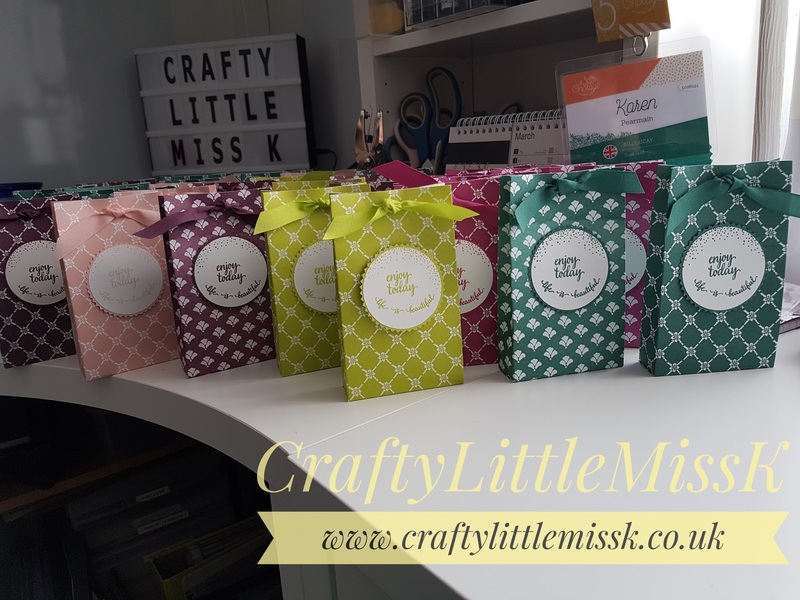 The treat box in the video is for a friend of mine - Anna - The pic below shows the treat boxes ready for my fellow Demonstrators on Saturday.